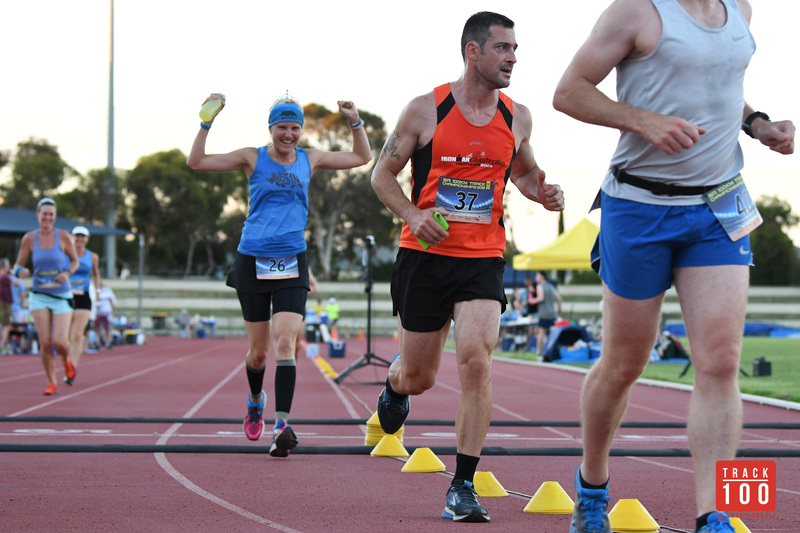 This past weekend was the third running of the SA Track Championships, the brainchild of Yumigo!’s Ben Hockings. An ultramarathon where it is impossible to get lost and where you are never more than 400m from first aid, hydration, nutrition and toilets! Sounds pretty good, right? Yeah, until you realise that you’re literally running around a 400m track for 50km or 100km. 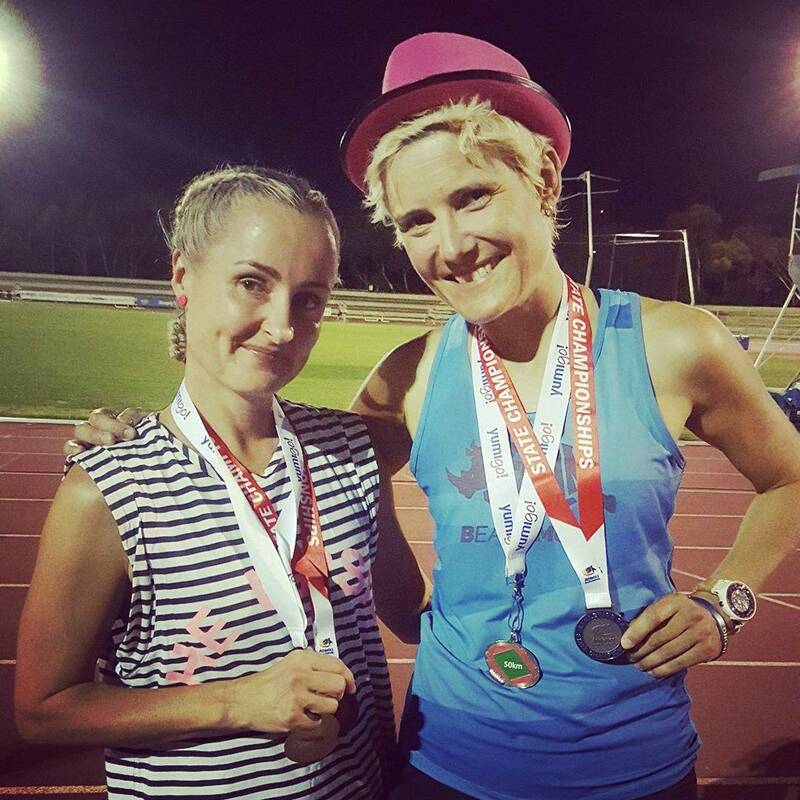 I ran the 100km at the first 2 Track Championships and if you want to read about THAT, you can read my 2016 and 2017 reports. I had planned to run the 100 again. I had looked at my Strava for the corresponding time last year, to see what I did in the way of training. I recalled that I didn’t do too much specific training for this event (it’s pretty hard to train for this kind of event!) but I did see that I ran 30km along the coast the week before. I’d had a pretty good run in the 100k that year so I figured I’d better do the same again this year! So I went out and ran 30km on a pretty hot day last Sunday, and had a pretty crap run! I was walk/running by 10km, I wanted to call an Uber at 15km, and I was running a full minute per km slower than I’m used to! So at that point I decided that I was definitely not in 100km shape, so I planned to run the 50km. However, with a forecast maximum of 420C on both Saturday and Sunday, so presumably not a particularly cool night on Saturday, I did consider the possibility of not running it at all! (I had missed the early bird cutoff date so I basically left it till the last minute to make the call! In the end I decided to bite the bullet and run the 50km. 50km is a different beast altogether! Whereas in the 100km I started having tactical walk breaks at about 30 minutes, theoretically I shouldn’t need to walk in the 50km. After all, it’s a marathon with a bit extra tacked on the end – and I have been able to complete most of my marathons without walking. Ordinarily, I would have expected to be able to run 50km in under 5 hours. My 30km run last weekend was JUST under 3 hours, so I wasn’t all that confident of the sub-5. Given the heat, I vaguely planned to do the run/walk thing like I had done in the 100km. In the lead-up week I did my usual Tuesday and Thursday runs. Friday was Australia Day and I had a pretty cruisy day including the traditional Australia Day cricket at the Adelaide Oval which thankfully Australia managed to win (after being 5-8 early on, England almost came back and won it!). 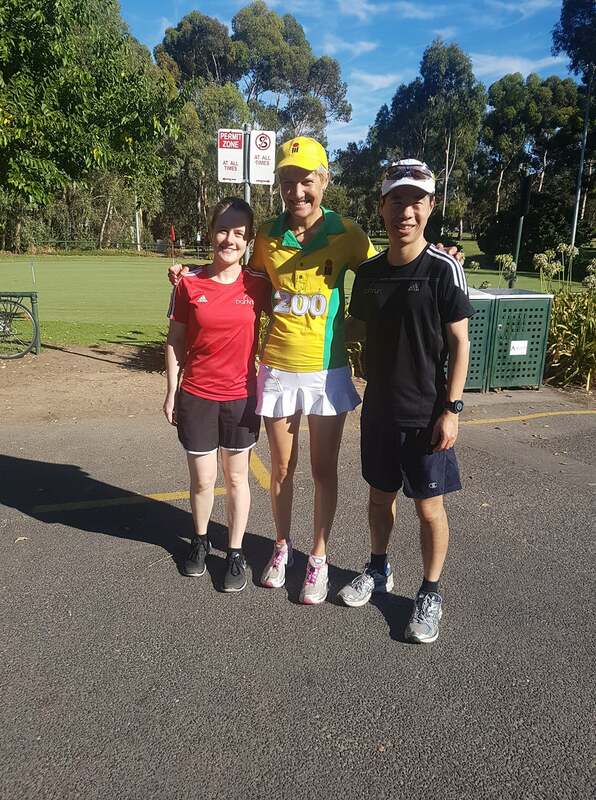 Saturday was scheduled to be my 200th parkrun which was a pretty big deal! I’d been liaising with fellow parkrunner John who was approaching his 250th and we had worked out that we could do our milestone runs together, back where we’d both done the inaugural Torrens parkrun a little over 5 years ago. Although it wasn’t ideal preparation for a 50k, if I hadn’t done my 200th that day I would have ended up doing it at the Port Broughton launch next weekend, and I preferred to do it at ‘home’. So I decided to do my first ever ‘parkwalk’, and as luck would have it, another friend Ellen was doing her 150th on the same day, and we ended up walking it together! Picked up a little cricket souvenir along the way! Fellow parkrunner and entrant in the 50k track race, Graham, said to me when I told him I was going to walk, that he bet I wouldn’t be able to resist breaking into a jog at some point! So I was determined to prove him wrong, and crossed the line in about 49 minutes, a nice leisurely walk! With Ellen and John after we’d achieved our milestones! I also picked Graham’s brain about the 50km, which he had done last year, and he said he did a run/walk. I had already sort of planned to do that, and Graham’s words confirmed that it was a good ‘sort of plan’. I re-read my reports from 2016 and 2017. I had taken mashed sweet potato last year but barely touched it, so I decided not to bother with that this year! I just took 2 sandwiches, one peanut butter and one chocolate spread. Along with that I had some almonds, a couple of nut bars and a couple of Clif bars. Hydration was going to be particularly important so I had 3 litres of Gatorade mixed up and ready to go in 6 bottles. That was the same amount I’d had for the 100km last year, so I didn’t think I’d need that much, but I figured it was better to have too much than not enough! Also in the esky I put a cider and a Coke for afterwards. 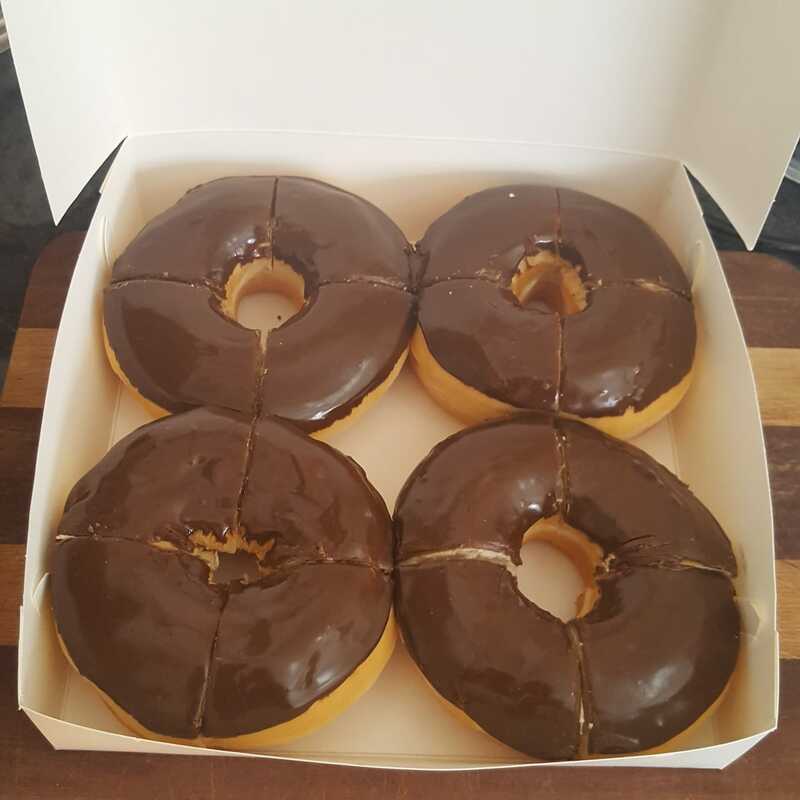 After parkrun I went to Bakery on O’Connell to get myself a chocolate donut for after the race, and on a whim decided to get 4 donuts to share with my fellow vegan runners. They are enormous donuts so I cut them into quarters! Due to the heat, the 50km event was put back an hour, from 7pm to 8pm. That worked out well because it meant that the sun would be almost gone by the time we started. It would still be hot, but at least we wouldn’t have the late afternoon sun beating down on us! The 100k start was left at 7pm, the thinking being that with a 14 hour cutoff, their cutoff time would be 9am. Should the start have been moved to 8pm, cutoff would be 10am, by which time it would already be pretty hot! I arrived at the track about 6:30 because I wanted to see the start of the 100km. To my surprise (well actually it wasn’t that surprising given the weather conditions!) there were only 8 starters in the 100 and they were all men! 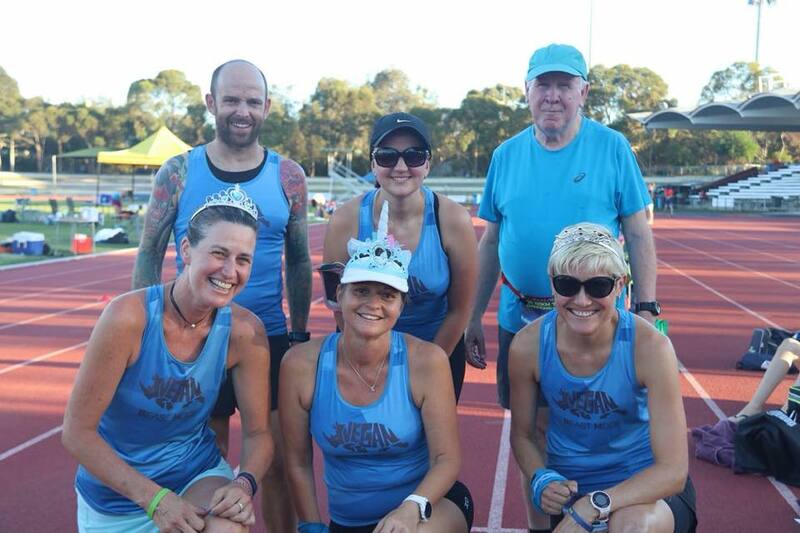 I saw Sam and her husband Clinton at the track, I had thought Sam was doing the 100km but she’d opted for the 50km too. She jokingly said she should upgrade to the 100km for a guaranteed win! I wondered, if I’d seen the start list and realised that there were no females on it, if I would have been tempted to enter the 100km! It would be a guaranteed win, IF I finished! And in those conditions, and given my recent form, there were no guarantees! 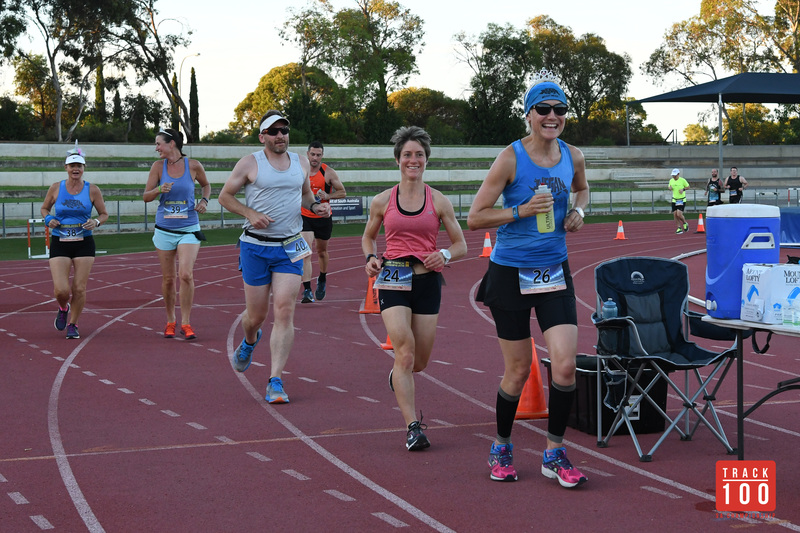 Along with the 100km starters, 2 of the 50km runners, Merle and Trish, were starting at 7 as they needed to be finished as early as possible. I couldn’t understand why anyone would CHOOSE to start this particular event an hour early (given that the first hour would be probably the hottest!) but it made sense! After the 100km runners and Merle and Trish set off, I went to get the rest of my stuff out of the car and set up my ‘base camp’. I seemed to have a LOT of stuff for a 50km run (actually more stuff than I had last year for the 100!). This year I was driving myself, whereas previously I had been picked up by Karen and Daryl, so I guess I tried to be a bit circumspect with how much stuff I brought! With just me in my car, I could bring as much stuff as I wanted! I had 2 eskies – one larger one with all the drinks, a bag of ice, plus a spray bottle full of water, and a smaller one with my food in it. I also had a 1.5 litre container of water (why I felt the need to bring that, I don’t know – there’s ALWAYS plenty of water on hand at events! ), a folding chair and a bag containing a few buffs, 2 pairs of running shoes and socks (I was wearing my Birkenstocks at the time), a change of top, plus a full change of clothes for afterwards. I also had my phone which this time I wasn’t going to carry with me. In previous years, although we had electronic timing, we couldn’t see the live results on the screen and had to rely on hourly updates on a whiteboard. Consequently I’d take a photo of the whiteboard every hour so I could see how I was tracking. This year there would be a big screen on the side of the track so we could see our progress at any time, negating the need for me to take photos! I’d also done roughly hourly updates on Facebook during my walk breaks, whereas in 2018 people could track us live online, so there was no need for that either! And finally, given that music was such a big part of my 100km runs, I had my iPod ready to roll, all cued up on Def Leppard’s “Pour Some Sugar On Me” – I thought that would be a good song to start with if I did decide I needed some tunes! 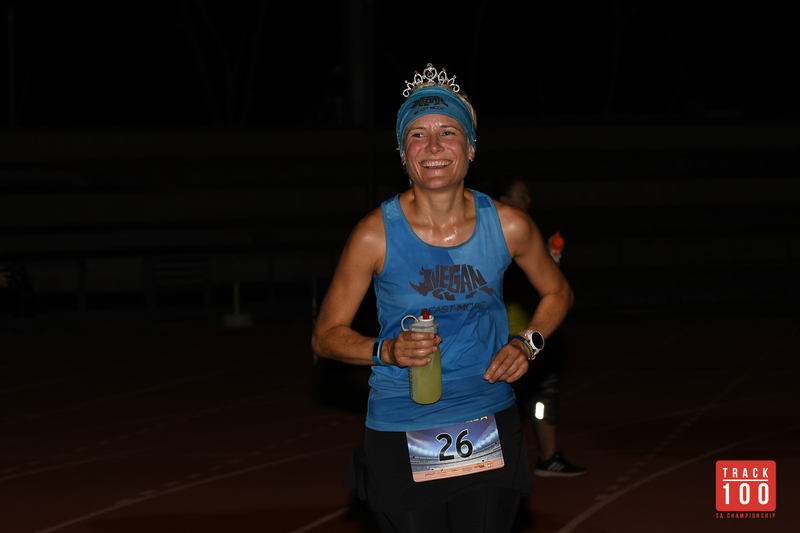 I wasn’t planning to use it – I’d only really started using it in the 100km late into the night after the 50km runners had finished. I’d never used it during the 2 6 hour events I’d done, so I suspected I probably wouldn’t need it. But in these conditions, who knew? Best to have it there, just in case! There were a lot of unfamiliar faces in the 50k, and a few in the 100k! Familiar faces included the Vegan Beast Mode Team (Ryan, Kate, Sheena and Tracey, the latter choosing to spend her birthday running around in circles!) plus fellow vegan Ian from Melbourne, Sam and Clinton from Victor Harbor (Clinton entered because it would give him something to do while waiting for Sam to finish! ), John who I’d met at the first 100km race and who had been back last year for the 50km, regular weekday morning running buddy Mark, Rachael who had been talked into entering by Kate only that morning, a couple of speedy runners Daniel and Toby (the latter having finished a few laps ahead of me in the 100k last year) and 2 very familiar faces in the trail running world, Kym and Mal, in an event that is about as far from trail as you can get! Vegan Beast Mode Team photo (thanks Gary) before the 50k. Back row: Ryan, Kate, Ian. Front row: Sheena, Tracey, yours truly. Because of the heat, a few measures were put in place. At a couple of spots around the track were large tubs of iced water, with sponges in them that we could use to cool ourselves off. 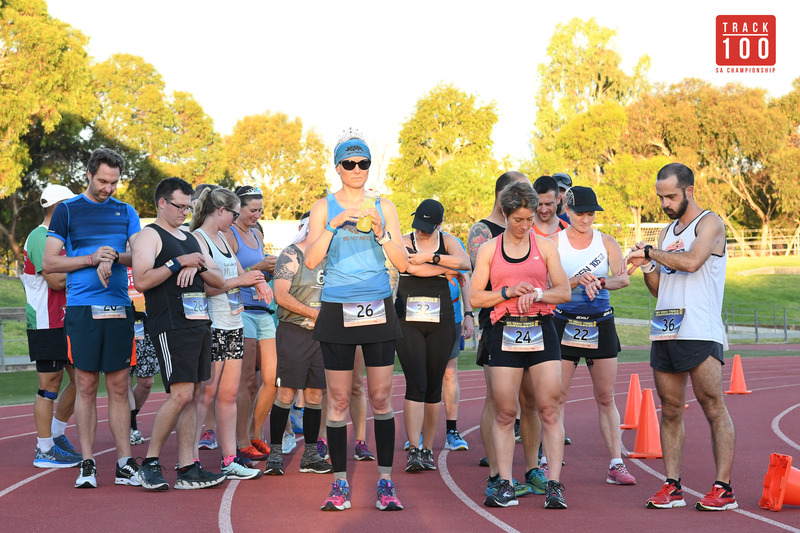 There was meant to be a misting station but that didn’t work out, so instead at the drink station the vollies were all armed with spray bottles of water – a human misting station! In 2016 the 50km runners and the 100km runners were all mixed in together, sharing the same lane. In 2017 the two groups were separated, with the 100km runners running in Lane 1 and the 50km runners running in Lane 4, separated by a line of cones. 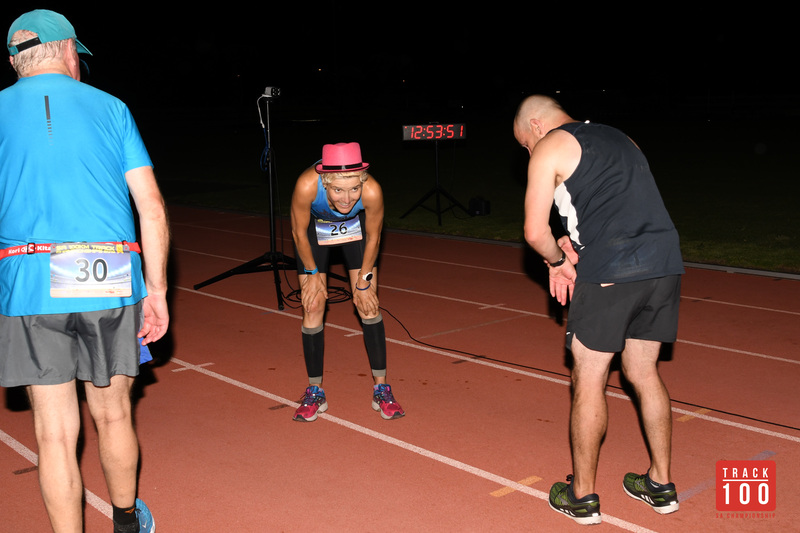 2018 was the same as 2017, with the 50km runners starting partway around the track so that we would still finish on the finish line. (Because Lane 4 is longer than Lane 1, the number of laps we would run would be less than half what the 100km runners did, and it wouldn’t be a round number of laps). I didn’t actually know exactly how many laps it was, I just knew it was less than 125! This year, for the first time, there was an official photographer for the first few hours – Tracie from Geosnapshot, who also happens to be an old school friend! I had suggested to her to come for the first few hours when she’d be able to capture everyone, we’d all look relatively fresh, and she’d get a bit of daytime and a bit of night! We started right on 8:00. According to the temperature reading in the stadium, it had dropped from 34 degrees at 7pm, to 33 at 8. I started with my sunnies on but wouldn’t need them for very long. I was also wearing a tiara, as were Sheena and Tracey, in honour of Tracey’s birthday. 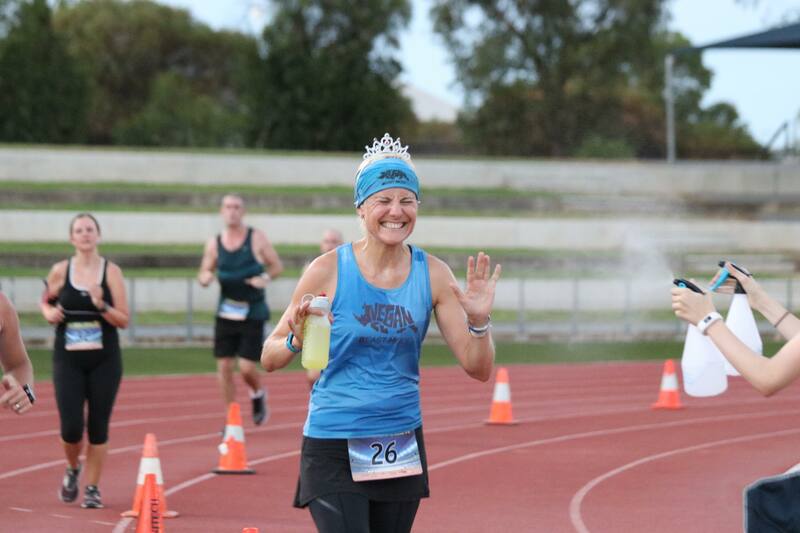 I’d never run in a tiara before! It became apparent early on that I was going to have a huge battle on my hands in the form of a girl called Ina who I had never met before. But all I could do was just do my thing, and if it was good enough, then great, but if not, I could be satisfied in the knowledge that I could not have possibly done any more! I decided to just run for as long as I could, despite what I had originally planned to do – it was a RACE, after all! 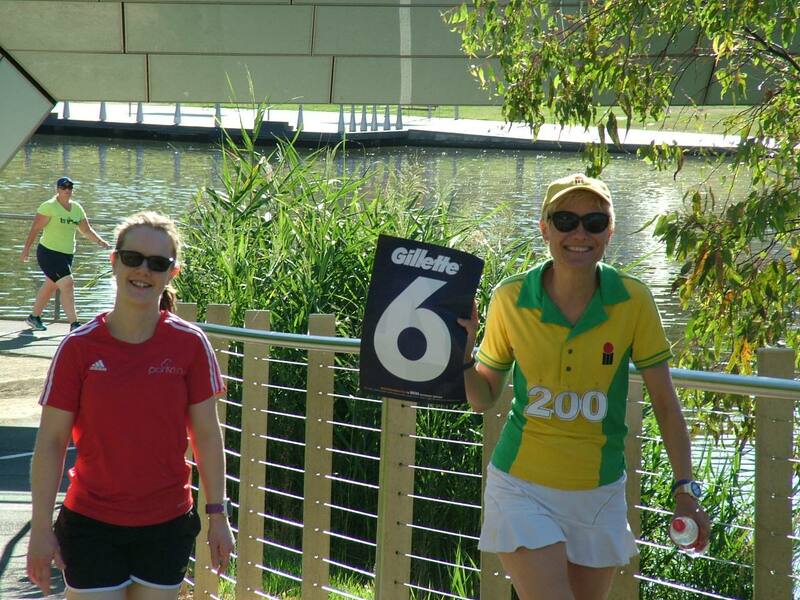 Probably one of my favourite spectator photos – just sums up how much fun Tracey and Sheena were having out there! It was kind of infectious! Pic stolen from Tracey! I started pretty comfortably, running consistent splits around the 5:20-5:30 mark. It was early days but all signs were looking good. I ditched my sunnies early, however my aim was not that great so they landed a fair way from my base camp – I totally forgot about them, never to be seen again! Getting rid of my sunnies! Pic thanks to Glen. I got to 10k in just under 55 minutes (according to Garmin which we all know is not 100% accurate so you can take all these time splits with a pinch of salt!) which was the furthest I’d ever run on the track (ie without walking). I decided then to try to push through to the 2 hour mark, when we would have our first turnaround. The turnarounds were every 3 hours, presumably to break up the monotony of running laps around a 400m track! As the 100k runners had started an hour earlier than us, the first turnaround was at 3 hours for them but 2 hours for us. Our next turnaround would then be at 5 hours. I planned (hoped!) to be finished by then! I can’t go any further here without thanking the fantastic volunteers at the drink/food station. As one who didn’t have a dedicated support crew, I relied on them. I was relatively self-sufficient, providing my own Gatorade and all my own food, but I did partake in some Coke a few times! At one point I decided I felt like water, and I grabbed a cup only to find it was warm! I was running with Kate at the time and she gave me the tip to ask for a cup of iced water which I did on my next lap. I’d ask on one lap for iced water on my next lap, and then one of the volunteers would have it ready for me. The iced water was magic! I don’t really like drinking straight water much, and when I do I tend to prefer it room temperature rather than chilled, but on this occasion it was just what the doctor ordered! Even more so than the Coke and iced water, the aforementioned misting station. Hopefully I don’t forget anyone here (and there was one guy there whose name I didn’t know, so apologies in advance!) but almost every time I went past the food/drink station, I would get squirted, initially just with spray bottles which was fantastic, but a little later Kim started shooting everyone with her big arse water pistol (which she was clearly enjoying VERY MUCH!) I remember getting sprayed at various times by Kim, Katie, Linna, Elle, Ken and Merrilyn. SO GOOD! Those spray bottles were MAGIC! Thanks Gary for this pic! I was also wearing a buff around my neck by now, as well as one on my head, so when I got squirted/tipped a cup of water over myself/squeezed a sponge over myself, the buff would get wet and keep my neck cool for a while. I was not watching the live tracker, and although I was using my Garmin to check my kilometre splits as the kays ticked by, I knew it wouldn’t be accurate. I quickly lost count of laps (which wouldn’t have been all that useful anyway given that I didn’t know how many laps we were doing!) and so I was just running, not trying to maintain any particular pace, just running by feel. The first indication I had of where I was positioned was when Ben did a progress update over the PA system, all I heard was that I was 2 laps behind Ina, and as far as I could tell she wasn’t walking, so therefore neither was I! I didn’t hear who was in 3rd place for the women and how far behind she was, but it didn’t matter – as long as whoever it was didn’t pass me, I would stay in front! And as long as I kept running, she probably wouldn’t pass me! 30km was the next goal. 30km was how far I had run last Sunday and I hadn’t been able to manage to run the whole distance then, so to be able to do it here would be a great mental boost. According to Strava, I reached the 30km mark in 2:49. The next goal was to tick off the marathon distance. In most of my marathons, I have run the whole way. I’d never previously RUN that far nonstop in an ultra, often because of undulating terrain that necessitates walking at times, and in the loopy ultras I seem to like, it’s about not going out too hard early and having nothing left at the end! Tracie had left the stadium around 9pm and came back a few hours later to snap some photos of us looking not quite so fresh, and also there was the added bonus of being able to capture some of the 50km finishers. Not long after she came back, I was closing in on the marathon distance and just under 4 hours. Even though I know it wasn’t an accurate distance, in my previous marathon at Boston I had JUST missed the sub-4 by a matter of seconds, so to get a sub-4 here would be very pleasing! 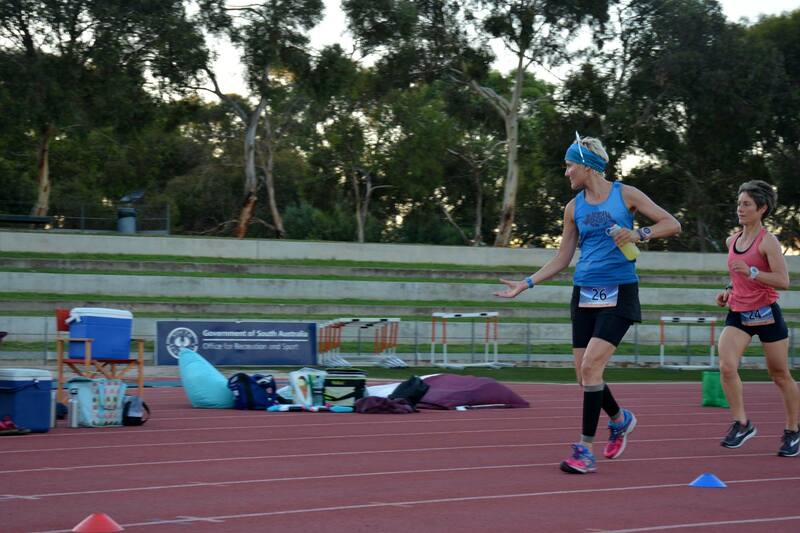 When I realised how close I was, I SPRINTED past Tracie and she wondered what I was doing – I explained it afterwards! I got the sub-4 by a matter of seconds – not bad considering I had done only one 30km run in preparation for this event and that’s it! I knew I was getting close. 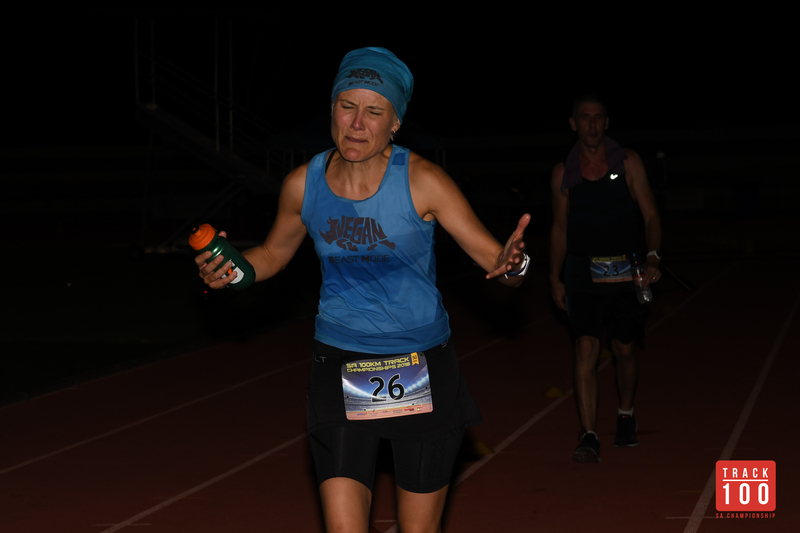 Ina was getting further away and showed no signs of slowing down or walking, but despite the fact that I knew I was definitely going to get second place, I figured I’d come this far, I might as well go the whole hog and run the full 50km – something I’d never done before! Running the whole way would also be the best way to ensure a sub-5! I was talking to someone along the way who had had some walk breaks and had found it hard to get running again. Given that I was treating it more like a marathon than an ultra, it’s not surprising that I didn’t eat anything during the run. I had enough Gatorade to last me (and a couple of bottles left over) and I ran the whole way with a bottle in my hand. I had the occasional Coke and that was it – just as I would in a marathon. It’s hard to eat food while you’re running (as it happens it’s also hard to drink Coke out of a cup – I managed to spill it down the front of my legs on one occasion so I had to ask the guy with the water pistol to shoot me in the legs to wash it off!) and I don’t do gels. Not long after I reached the ‘marathon’ some of the faster runners started to approach the end. One of them, Justin, when I ran with him for a bit, was 2 laps ahead of me. It turned out he knew Tracie too – that is SO Adelaide! As we crossed the timing mat someone called out that Justin was on 100 laps and I was on 98. I managed to keep track of laps after that! At one point Tracie had asked me how many laps the 50km runners were doing, and I didn’t know but someone around me said 118. Actually it was 119 (the first lap being just a part lap, so it was really 118-point-something). 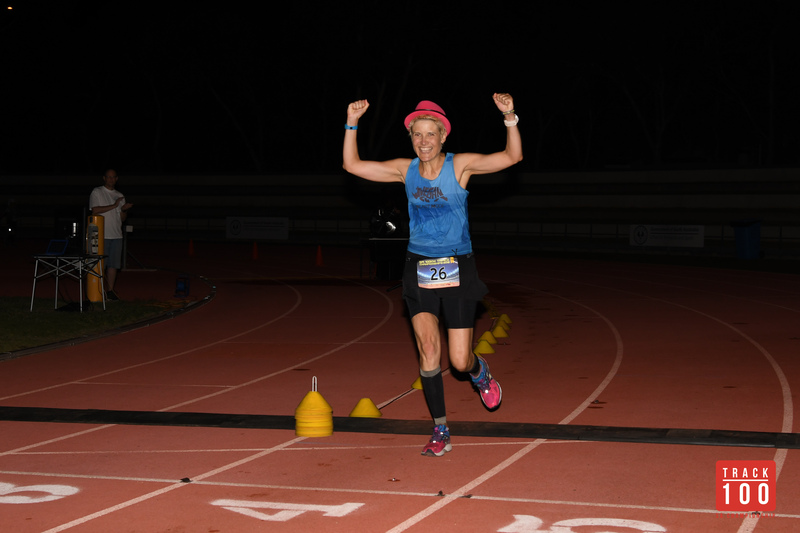 I had around 20 laps to go – the end was in sight! From then on I started counting up laps (I didn’t want to fall into the trap of counting down until I knew I was down to maybe 5 laps) and it was a good way of distracting myself! In the 100k event there was a clear leader, Darren, who reached 50km in just 4 hours! I planned to stick around afterwards long enough to see him finish – it was unlikely that I would get to see any of the others finish! The rest of them were motoring along – Stephan was there to do it all again after coming up short by about 4km last year. The extra 2 hours should have made a finish a no-brainer for him, but the weather conditions were going to make it very difficult! 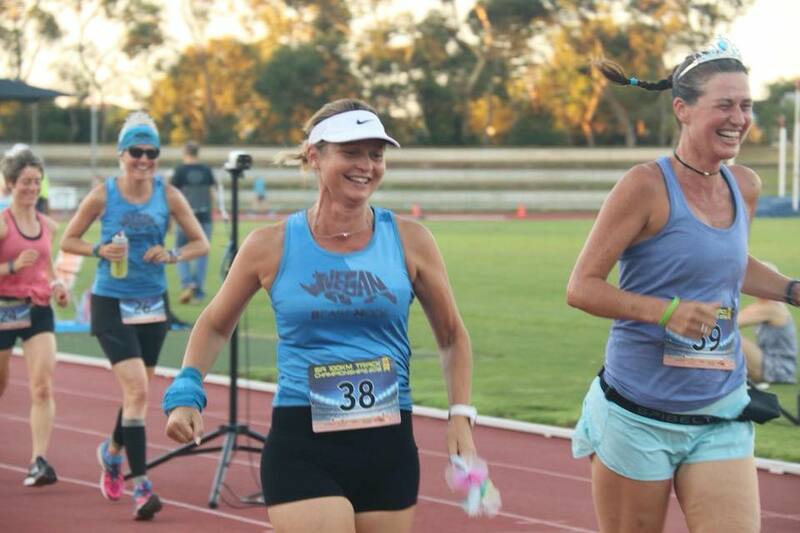 The rest of the girls in the 50k were looking good but the ones who were clearly enjoying themselves the most were Tracey and Sheena! Sheena was doing her thing that I remembered her doing last year, she would walk quite a lot, but then break into a sprint! On a few occasions when they came up behind me they would sprint to get past me, then back into a walk again! The next thing I was waiting for was for the 3 runners ahead of me to finish, then I would know I was nearly done! Andrew was first, closely followed by Ina. Next was Justin, but when he came up behind me, I had caught up a bit, he had had a pit stop so when we crossed the timing mat Ben told us we both had 2 laps to go. Which was great, except that on MY previous lap Ben had told me that I had 2 laps to go! I asked him to check it because if I was on my last lap I would run it quite differently than if it was my penultimate lap! Imagine the devastation if you crossed the line having gone hard on what you thought was your last lap, and then being told you had a lap to go? Nope, it was definitely my second last lap. I took it relatively easy on that lap (2:25) and when I got to the bell lap it was on! I got to my chair, took off the buff I’d been wearing for the whole race, and put on my pink fedora to finish the race! FINISHED ! So good! I was beyond stoked, I never would have expected to be able to RUN 50km nonstop in these conditions (it was still 32-33 degrees by the time I finished) with limited training, and although I had hoped for a sub 5 hour finish, again the weather conditions meant that it was hardly a foregone conclusion! 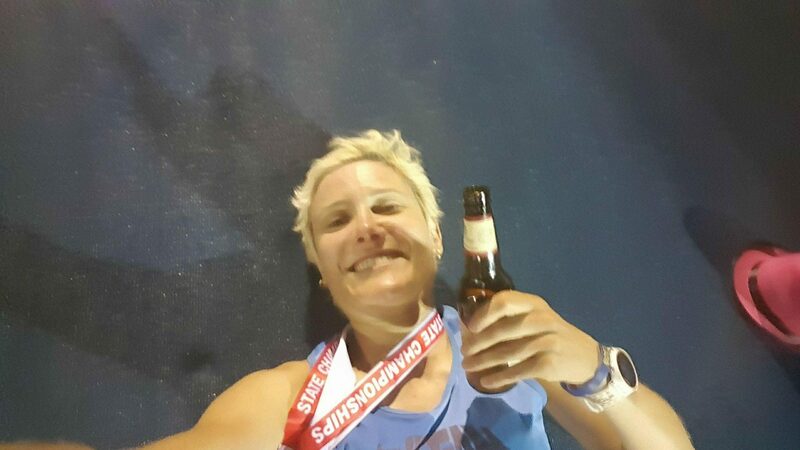 Fastest 50km, first all-run 50km, could not be happier! 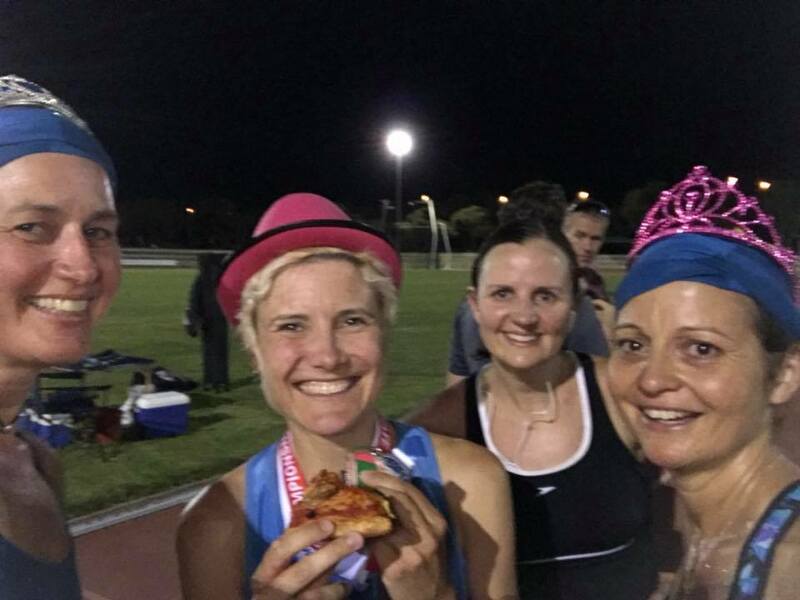 I had my vegan donuts ready and there was ample pizza this time (last year I had missed out, but then again I had run the 100km so it had been a lot later by the time I was ready for it!) – this year ALL of the pizza was vegan! ALL OF IT! We are taking over the world, one ultramarathon at a time! But first things first, a quick photo op of the top 2 men and women in the 50km. Tracie’s camera battery was about to run out so she wasn’t able to wait for the 3rd placed man and woman to come in. 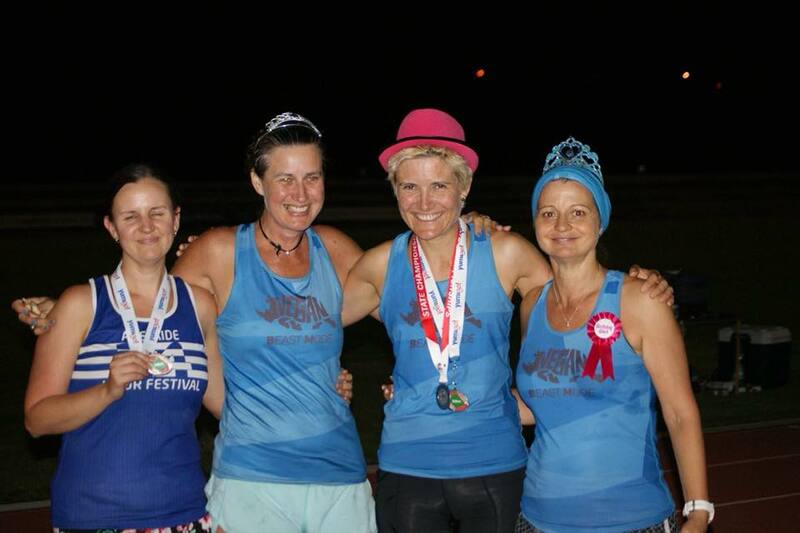 We got to the podium, and Tracie wanted me to stand on the ‘3’ spot, to which I replied, “No, I was 2nd! I’m not standing on the 3” (I was already standing on the ‘2’ spot while I was saying this!) I presume it was to spread us out across the podium but I was having none of that! In the end we all stood on the ground in front of the podium. MUCH better! Justin had a beer in his hand so I thought it was an appropriate moment to crack open the cider! The 50km runners kept finishing. Matthew, Andrew and Toby finished in quick succession, followed closely by 3rd placed female Gabrielle, who I hadn’t met before. I went over to her picnic rug to have a bit of a chat and a photo. With Gabrielle near the finish line. Not long after that, Graham finished. I could see him coming (the hi-viz yellow top giving him away!) and for half a second I did think about chasing him to the finish (as he had done to me at the Tower Trail Run) but as I was in my Birkenstocks by now and comfortably sitting down, I quickly decided against it! I eventually got around to having some pizza and donut – I started off just taking one piece of pizza (remembering how devo I was when I missed out last year!) and then realised that there was a CRAPLOAD of pizza. And did I mention that it was ALL VEGAN? It was nice to be able to just sit back and relax, drink my cider and watch the world go by. And by ‘the world’ I mean ‘crazy runners’! I found a great spot, just near the finish line, actually on the long jump pit. Imagine lying on the beach, but on a towel so you don’t get sand all over you. That was what it was like – I could have stayed there all night! Chilling on the long jump pit! A little while after fellow Team Vegan member Ryan, I was at the finish line to see Kate, who was accompanied by the ever-present Tracey and Sheena. Of course they were a fair way off finishing themselves, but they were there to join in Kate’s finish line party! It was apparently pretty early on who the likely winner of the 100k event was going to be. Darren was going from strength to strength. Being separated by 2 lanes, I didn’t see him lap me as many times as he undoubtedly did, but when I heard speedy footsteps 2 lanes away, I knew who it was! 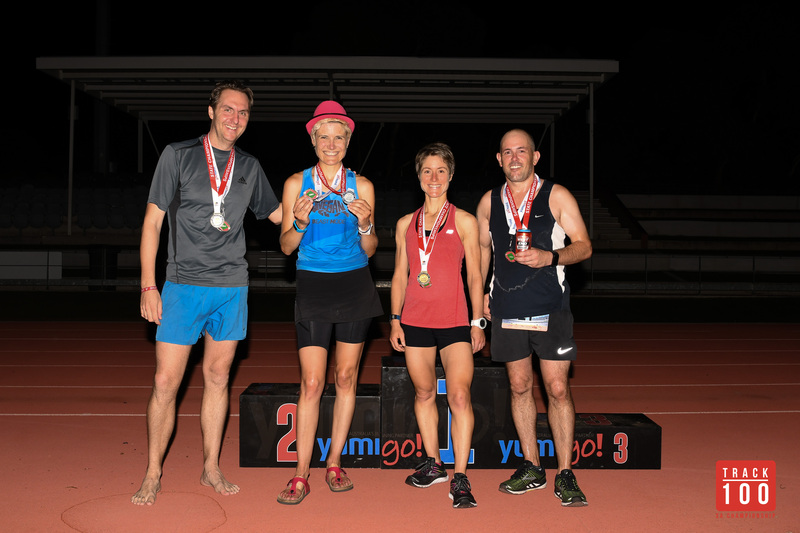 At 3:16am, in a super impressive time of 8:16:19, Darren crossed the line to win the SA 100km track championship. I didn’t see him walk once! 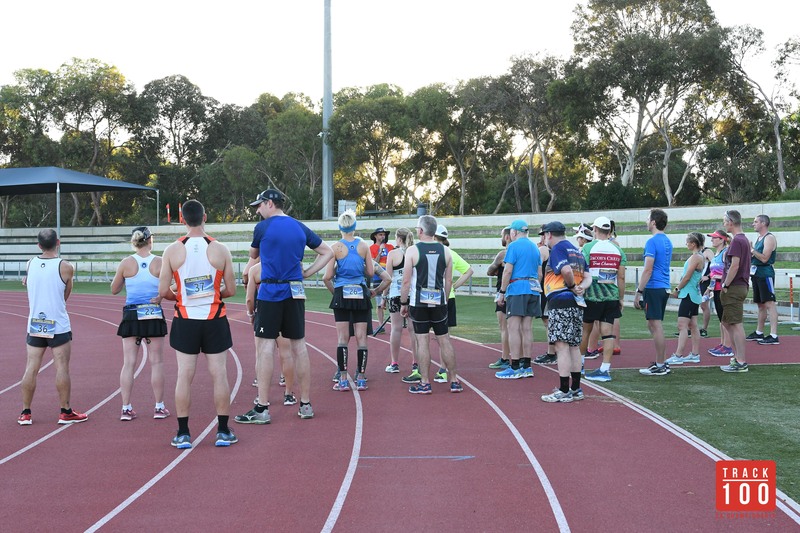 Before too long, ultra running legend Kym finished (he has now done every Yurrebilla 56k, every Heysen 105k and every track champs 50k – a fairly exclusive club of which he is 100% of the membership!) leaving Tracey and Sheena with Lane 4 all to themselves! Somehow Sheena was 2 laps ahead of Tracey. We wondered what they were going to do, because I couldn’t see any scenario in which they wouldn’t finish together! We soon found out. 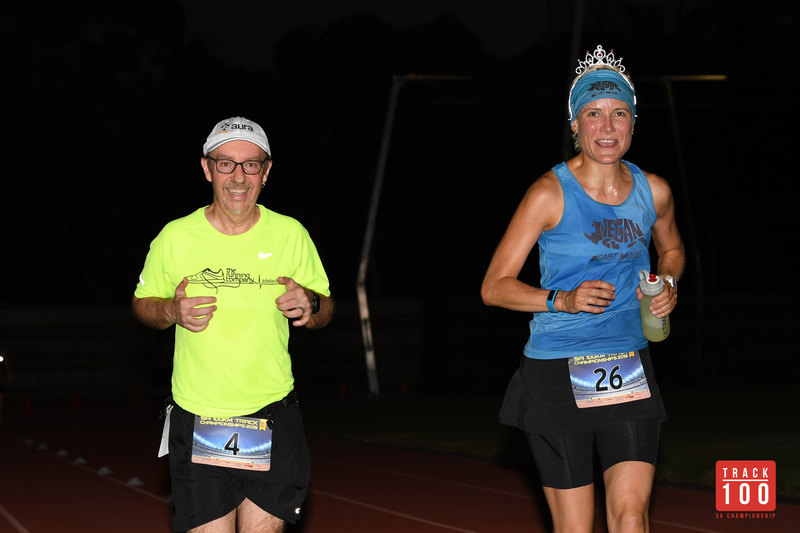 It was so great to see the two of them finish together, what better way for Tracey to celebrate her birthday? We stayed for a bit longer after that, chatting with a few of the volunteers and Susan. The conversation soon (as it always does) turned to hydration and wee colour. I made the mistake of telling Susan that I hadn’t been since before the race started (so this was about 9 hours later!) – she was horrified! Then when I did eventually go, she showed me a chart and asked me what colour it was – suffice to say I needed to drink a LOT of water to rehydrate! I had one last look at the live results before leaving. Looking at Colin and Stephan, it looked like they should be able to make cutoff time but it would be a near thing – there wouldn’t be time for much resting! Then I realised that I could have packed all of my stuff into the car while we were waiting for Tracey and Sheena, my 2 eskies, chair, bag of clothes and shoes, and all the rest! Luckily super volly Ziad was happy to help me carry my stuff so I only had to make one trip to the car! The security guards (who were there all night – what a boring gig for them!) escorted us to my car – apparently some weirdos hang out at the athletics stadium on a Saturday night! I wouldn’t have thought they would be any weirder than the weirdos INSIDE the stadium! And then, just before 5am, I headed home. After unloading the car, having a shower and donning the compression tights (Recovery Tip #2 – put compression tights on ASAP after the event, ideally for 24 hours!) I finally got to bed at around 6am. If anyone had asked me how my Saturday night was, and I started by telling them I got to bed at 6am, they may have had quite a different picture of how the night went! Sleeping is overrated as all ultrarunners know, so I was awake again by 9:30. First order of business (after making sure my legs still worked) was to check the final results – cutoff time was 9am! I was so happy to read that Colin and Stephan had both finished within the last 10 minutes. Stephan had made it with just over 4 minutes to spare! After he had missed out narrowly last year, I was over the moon for him! I would have loved to have been there to see it! In hindsight, I probably would have slept just as well lying on a high jump mat at the stadium than I did at home (especially on such a warm night!) I’m certainly not hoping for another night like this next year, but sleeping at the stadium would have been quite pleasant this time around! And now for the thankyous. Firstly, congratulations to everyone who turned up to run this year – much respect for braving the heat and getting out there and doing it anyway – in fact this year was a record field which is amazing! And THANKS too, to all the runners, everyone as always was very encouraging and supportive, and it was great having the company out there! Thanks to all the support crews, who were mostly there supporting other runners but were always happy to give anyone a cheer as they went past! 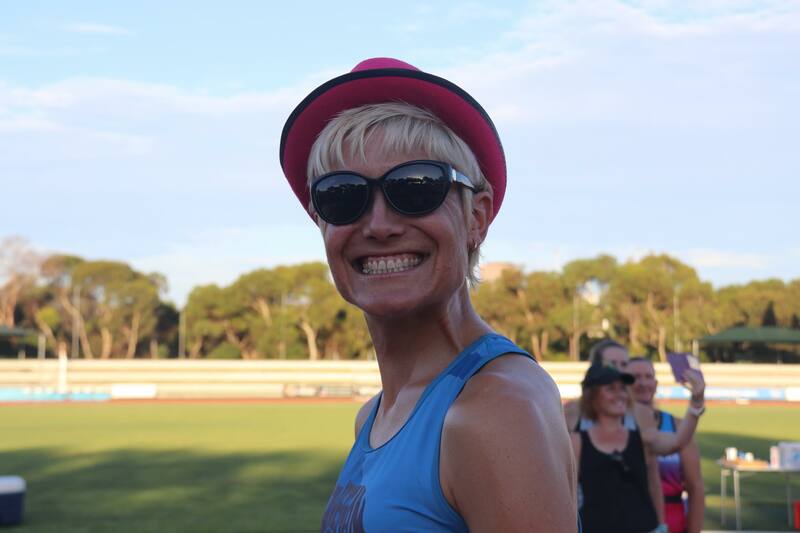 To all the people who came down to support us – it’s always good to see friendly faces on the sidelines and cheering – even though they probably would rather have been in the pool or inside with the aircon cranked up! 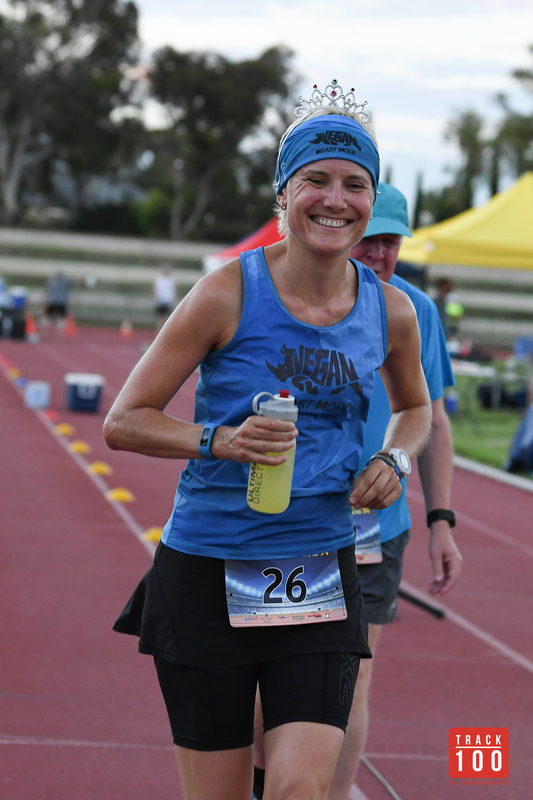 To Susan for helping me with my shoes and making sure I was rehydrating appropriately – and for everything you do for our running events! Always great to see you out there and even better to not require your services! 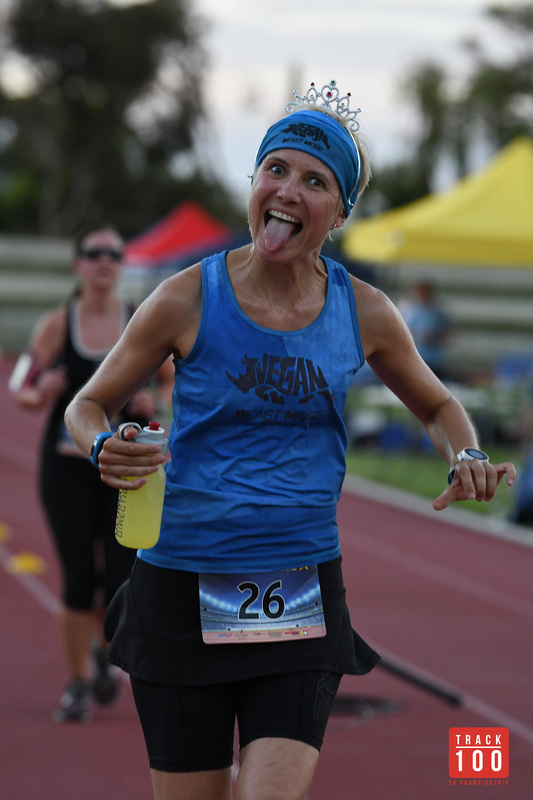 To Tracie, official photographer – it’s great to have some photographic evidence of the different stages of the race! Hope watching us run around in circles wasn’t too boring for you! Then of course, all of the FABULOUS volunteers who kept us hydrated and as cool as possible in the conditions! I can highly recommend this event to anyone who wants a challenge. 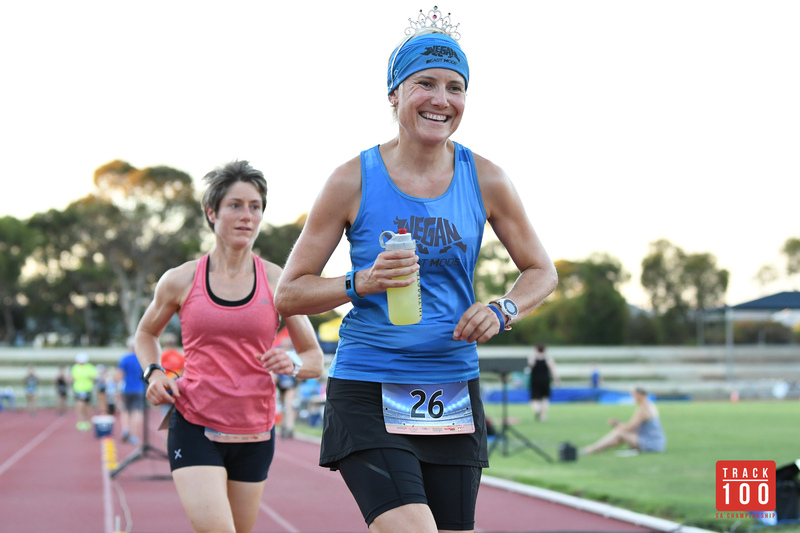 The 50km is very doable for anyone – with a 13 hour cutoff time this year, you could walk it quite comfortably! Support is never more than 400m away and you don’t need maps, compasses or snake bandages! 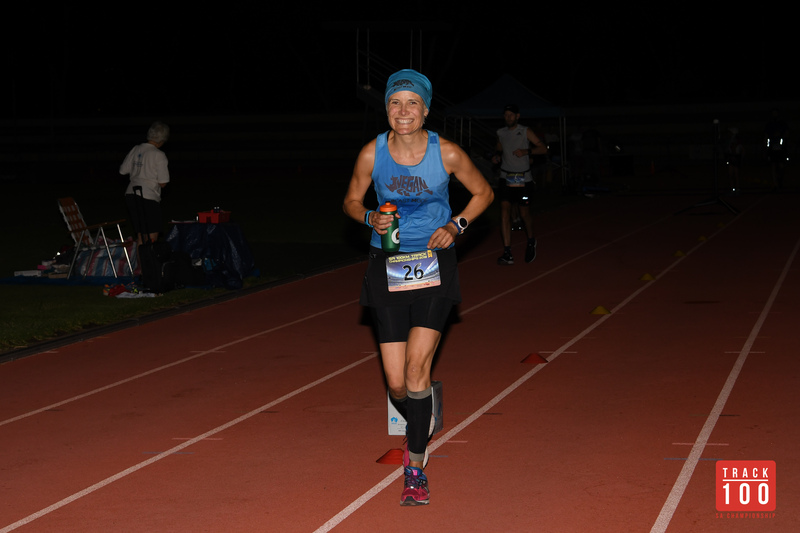 If you want an even bigger challenge give the 100km a crack – this year’s 14 hour cutoff is a lot more achievable and I can’t imagine you’ll ever find a flatter 100km race! So, will I see you there next year?